Here is a charming collection of warm woolen mittens and stockings to celebrate the Christmas season. Easily constructed and full of charm. These ornaments are suitable for trimming the tree or decorating packages. Tiny surprises can be tucked inside each one. Designs include a Santa, snowman, cat, sheep, holly, and Christmas tree. Colors used are cobblestone, red, green, black, white, and gold. 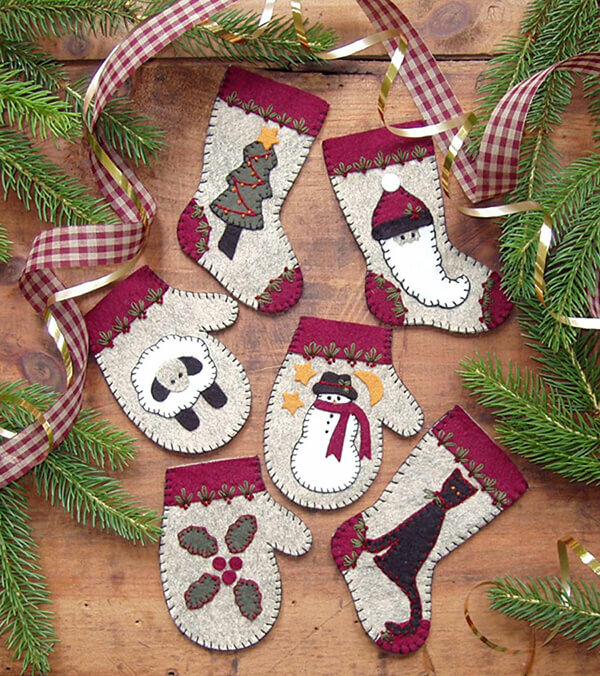 Kit includes wool felt, embroidery floss, and gold string plus precise patterns and complete instructions to make 3 stockings and 3 mittens.